It’s a common experience for many homeowners who live in Vancouver: a sudden, overwhelming infestation of sugar ants. It can seem to happen out of nowhere. Your once clean, quiet, and pest-free home turns into a seemingly endless ant colony. If this sounds familiar to you, then know this: You are not alone. Sugar ant infestations are very common in Vancouver. Luckily, we have solutions that will get your home back in order. As its name suggests, sugar is pretty important to this species’ existence, with glucose being its primary source of energy. Due to highly sensitive sugar receptors built into their antennae, these ants are incredibly adept at locating sugary substances — inside and outside of the house. A remarkably resilient insect, worker ants are capable of foraging for glucose with missing or damaged legs. Their instinct for for finding sugar and expanding their colony is so strong that queen ants are capable of laying eggs even if their abdomens have been crushed. How do sugar ants get indoors? Frustratingly for homeowners, the basic combination of soil, structure, and landscaping is the perfect recipe for sugar ants. Maybe you have trees in your yard. And maybe those trees secrete a glucose-rich substance. That will surely attract ants. Naturally, the ant colony’s sensitive abilities to detect sugar will also detect that your home possesses the moisture and nourishment it craves. If your home has the right type of vulnerabilities, you’ll soon find yourself with some unexpected houseguests — the kind that will invite their friends and that have no intention of leaving. Due to their small stature, penetrating your home can be easy because they can invade your space in a number of ways. Sugar ants can come into your home via houseplants, poorly sealed window or doors, the small holes where utilities enter the home, cracks in the foundation, or damaged or missing vents or screens. With so many options for entry, it’s no wonder these types of infestations are so common. Of course, once they’ve gained access to your home, they will hatch more eggs to grow their colony. Begin looking for their nest by investigating areas that might be dark, humid and moist. Kitchens and bathrooms are common locations — think cabinets that contain plumbing, wall voids, and vents — for ants to establish their nests. Luckily (if you can consider yourself lucky in this situation), is that sugar ants rarely bite. Not only are they motivated by seeking out moisture and sugar, they’re physically different than ants that cause people harm. Those ants push venom into skin through a stinger, whereas sugar ants pinch with their mandibles, with the former being more painful. In those rare instances where a sugar ant will bite, it’s not typically painful and only in those rare instance where a person is highly allergic does it cause a problem. Do sugar ants cause damage to property? One of the first assumptions people can make when they discover they have an ant infestation is that the ants will do unthinkable damage to the home. The reality is that sugar ants rarely cause property damage. They’re not wood eaters, like termites or carpenter ants, so that’s one concern you can be free of. The easiest way to avoid an ant infestation is to take the proper precautions — those that reduce an ant’s interest from entering your home in the first place. Our recommendations are pretty simple, and, if done as recommended, may help to prevent an ant problem to begin with. Take out the the Trash — It’s important to empty your garbage cans, particularly if your trash contains food waste. If you can, do so on a daily basis and keep your trash can outdoors so that it doesn’t attract pests indoors. Keep those surfaces clean — Crumbs and food waste, especially if you have little ones, can accumulate under tables and dining surfaces. Keeping these areas clean after each meal reduces your risk of infestation. Same goes for all eating surfaces like tables and countertops that accumulate crumbs or spills. Run the dishwasher — Don’t keep dirty dishes in the dishwasher. Even if you’ve rinsed your dishes before filling the washer, food residue can attract unwanted pests. Run immediately after filling. Lawn maintenance — In general, it’s important to avoid the overgrowth of vegetation on your property if you want to reduce the risk of ant infestation. It’s particularly important to avoid overgrowth and minimize vegetation within (at least) one foot from your home. Avoid repellents — Over the counter repellents that are for outdoor use (like the contact kills variety) and many others have a tendency to drive ants indoors, turning a potentially small outdoor problem into a big indoor one. Remove standing water — Standing water and perpetually wet ground is a huge attractor of sugar ants. Keeping areas where this can accumulate free of water will go a long way in preventing sugar ants from gathering there. Though there are a myriad at-home or DIY ways you can find to treat sugar ant infestations, the most serious approaches typically fall into two categories: 1) baiting, and 2) quick-kill treatment. Whichever method you choose, please take proper safety precautions. IMPORTANT NOTE ON SAFETY: Spray ant killers, baits, and other store-bought treatments can be dangerous. These products contain poison, and their ingredients and should be considered harmful to pets and children. Always read and follow any instructions included with these products should you choose to use them. So, which treatment should you choose? Where should you treat your home? How can you treat an ant infestation safely? These are common concerns and can pose a challenge to homeowners unfamiliar with the process. In terms of DIY options, we find ant bait to be the most effective home treatment. Quick-kill sprays do work (in a way), but they are most effective on foraging (visible) ants and aren’t designed to eradicate the unseen aspects of an ant colony. What’s more, these sprays can actually cause a colony to segment, unintentionally making the problem worse over time. Baiting products tend to be more effective, because they cause ants to take the poison back to the colony itself, and work to eradicate foraging and unseen ants. However, the strength of these off the shelf solutions isn’t as strong as professional grade solutions, and, aren’t nearly as effective. To avoid these partially effective methods, we recommend the advice of a professional. Aspen Pest Control’s pest control technicians are experienced in treating ant infestations in Vancouver, and can inspect your home to gauge not only the extent of the infestation you’re experiencing, but will help you determine the best long-term treatment. Aspen uses a specialized sprays and baits that are non-repellant, and are specifically designed to get to the source of the infestation by disrupting and ending the life cycle of the colony. Aspen’s ant treatment is a proven and effective method. We’ve served thousands of happy clients in Vancouver, and are so confident in our methods that we proudly offer homeowners a free re-service guarantee. What does this mean for you should you choose us for your ant infestation solution? If the ants come back after we’ve provided treatment, Aspen will come back and retreat the home absolutely free of charge. Who can I call for ant extermination in Vancouver? If you’re currently experiencing a problem with sugar ants—or any type of ant—know that you’re not alone. Ant infestations are a common problem in the Vancouver, WA area. It’s something that nearly all Vancouver residents have to deal with at some point in time. Aspen Pest Control loves serving our Vancouver community including family homes and businesses. 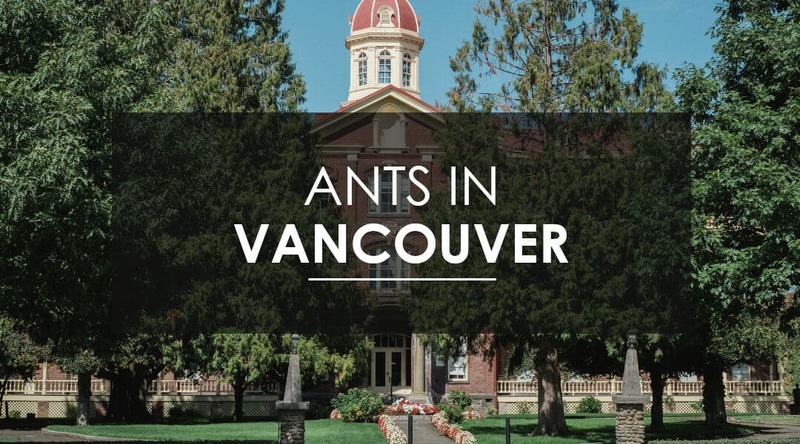 We have successfully treated many homes in Vancouver for all types of ants. We know that the stress induced by putting up with these little pests is simply not worth it. Contact us discover why your neighbors in Vancouver are loyal customers of Aspen Pest Control.